Nearly immediately after Malaysian Airlines Flight 17 was downed by a surface-to-air missile on Thursday, all eyes in the West turned to Russia. Ukrainian and Western officials, along with most of the Western press, have all but blamed the incident on Russia. Even if Russian agents weren’t directly involved in the incident, Russia is accused of providing the rebels with the material and technical support necessary to carry out the attack. For Ukrainian and Western officials, this is a smart strategy. If I was an adviser to the U.S. or Ukrainian government, I would undoubtedly advocate that trying to leverage the tragedy to pressure Russia to abandon its support for the pro-Russian separatists in eastern Ukraine (albeit, I would advise against making falsifiable accusations before the facts were in). I would also advise that the American or Ukrainian government seek to use the situation to rally greater European support for sanctions against Russia if Moscow did not back down. There are good reasons to think that this strategy would work and the downing of MH17 will end up being a game changer in the ongoing civil war in the Ukraine. That being said, the Pacific Realist is not on the payrolls of the U.S., Ukraine or any government. As such, I feel at liberty to state what seems to be increasingly obvious but largely ignored: namely, that it’s quite possible that Russia wasn’t directly involved in the MH17 incident. Which isn’t to say that it is not possible that it did play some role. U.S. and other intelligence seem to confirm that the surface-to-air missile was fired from rebel-controlled areas of the Ukraine, not from Russian soil. Still, Russia has non-uniformed military and intelligence officers on the ground in eastern Ukraine, and some of these forces could have participated in the operation that shot down the plane. Alternatively (or additionally), Russia could have provided the rebels with the Buk surface-to-air missile system that was used to shoot down the plane. Even if Moscow didn’t provide the system itself, it could have provided the rebels with technical training to allow them to operate the system. Still, it seems increasingly likely that Russia wasn’t involved at all (at least directly). While Russia certainly has some military and intelligence officers on the ground, it’s difficult to believe they’d be incompetent enough to think it’s a good idea to shoot down an aircraft flying at a high altitude without having any idea whether it is a military or civilian plane. I understand that many in the West see Russia as an adversary, and rightly so. But it is foolish to assume that one’s adversaries are stupid. It’s more likely that Russia provided the rebels with the Buk surface-to-air missile system that was used in the attack. After all, Moscow has been providing the rebels with anti-aircraft weaponry for some time now. At the same time, there’s good reasons to doubt the system used against MH17 came from Russia. To begin with, it’s not clear what Russia would stand to gain from providing the rebels with such sophisticated AA systems. Russia clearly has an interest in disrupting and neutralizing Kiev’s ability to use air power against the rebels. However, given the fairly limited air capabilities of the Ukraine military, the rebels could significantly disrupt air operations using more rudimentary anti-aircraft weaponry like MANPADS. Transferring these to the rebels would carry far less risk for Russia than giving them more sophisticated systems (for example, MANPADS can’t shoot down civilian aircraft flying at high altitudes). 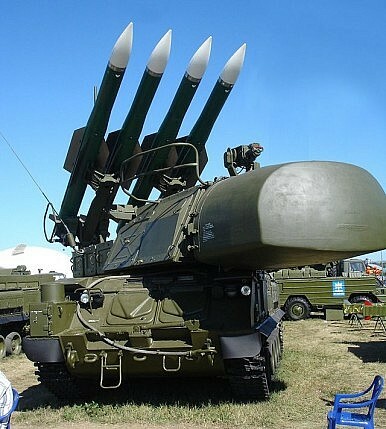 More importantly, the Ukraine military also operates Buk surface-to-air systems, and there were reports last month that the rebels had captured at least one of these systems from the Ukraine military. Thus, while it wouldn’t be shocking to learn Russia had provided the Buk system that shot down MH17, it seems at least as likely that the system originated from Ukrainian forces. Russia would be most likely to have provided technical training to the rebels to enable them to operate a Buk system they had captured. Although the system is fairly easy to use relative to other sophisticated anti-aircraft missile systems, the individuals operating the system would have to have had some training. And training the rebels to use a Buk system would be less detectable and less egregious if Russia was caught red handed doing it (at least, it would have been seen as less egregious had the rebels not shot down a civilian aircraft.) Moreover, Gen. Philip Breedlove, head of U.S. European Command, told reporters last month that Russia has training the rebels in using anti-aircraft weapons. For all these reasons, it’s more likely that Russia provided training to the rebels rather than provided them with the actual Buk systems. However, there is an equally plausible alternative explanation; namely, the rebels using the Buk system had been trained by the Ukraine military. Of course, the Ukraine military wouldn’t have trained them to use the system while they were rebels. However, it stands to reason that some of the current pro-Russian Ukrainian rebels formerly served in the Ukrainian military. After all, only a few short months ago the Ukraine government was controlled by Viktor Yanukovych. Not only is Yanukovych pro-Russian, but he was born in Donetsk Oblast (the province where the plane was shot down), became its Vice-Head in 1996 and then served as its governor for five years between 1997 and 2002. In other words, the plane was shot down in Yanukovych’s home base. It’s hardly unthinkable that some members of the Ukraine military were loyal to the Yanukovych government and Russia, and therefore left the armed forces to join the rebels when the former government was overthrown by western Ukrainians. Thus, some of the rebel forces most likely have prior experience operating the Buk systems from their days serving in the Ukraine military. Since rebel forces reportedly acquired the Buk missile systems from retreating Ukraine forces last month, but only started using them earlier this week, it’s possible it took the rebel leaders two weeks or so to locate former military men who had experience operating the systems, and/or spent time having them train other rebels in how to use the system. Three points are worth (re)emphasizing. First, none of the above rules out the possibility that Russia was involved directly in downing MH17. It merely suggests that Russia wasn’t necessarily involved directly in the incident, as many in the Western media seem to assume. Second, regardless of whether Russia was directly involved or not, American officials should continue to try and blame Russia for it in order to get Moscow to withdraw its support for the rebels or convince Europe to increase pressure against Russia. In doing so, the Obama administration should be careful to avoid making accusations that Moscow can later disprove conclusively. However, the situation is murky enough that the White House has adequate ammunition to use against Russia, especially if its charges are more general and vague. Finally, even if Russia wasn’t directly involved in the downing of MH17, it is not altogether faultless. In fact, it shoulders a significant amount of blame simply because it has been giving the rebels enough support to allow the conflict to continue to escalate this far. The MH17 tragedy has underscored the risks states incur when arming non-state actors. Hopefully this lesson will be taken to heart not only by Russian officials, but also by their counterparts in other states that arm or are considering arming non-state actors– including Iran, Pakistan, Saudi Arabia and the Gulf states, Turkey, the EU, the U.S and many, many others. More on this later. To read The Diplomat’s full coverage of Malaysian Airlines Flight MH17, click here.